Move over traditional sightseeing, throngs of visitors, and tourist traps Explore Europe on Foot gives travelers an alternative way to discover Europe. A hiking vacation offers countless rewards: the time to admire the tidiness of a village farm, soak in the rugged alpine view from a rocky perch, and absorb a country through the smells of its landscape and encounters with locals. 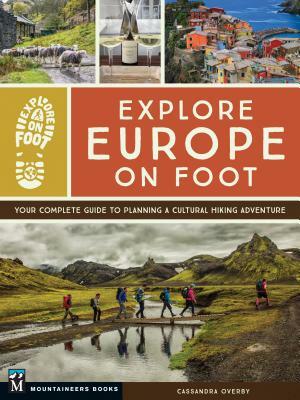 Explore Europe on Foot is a complete guide to conceptualizing, planning, and executing the slow-travel hike (or hikes ) of a lifetime. Author Cassandra Overby tells you how you can spend all, or even just part, of your vacation enjoying scenery, small towns, and cultural experiences most travelers miss--all without carrying a big backpack. This guide offers all the nuts and bolts you need: how to choose a route that is right for you, how to plan, what to pack, what to expect, how to find accommodations and food, how to deal with challenges along the way, and so much more. These aren't wilderness backpacking trips, but rather a wide range of town-to-town walks that offer the opportunity to have an authentic, affordable, restorative vacation. Travelers will also appreciate overviews of fifteen long-distance trails in Belgium, France, Italy, Germany, Great Britain, Morocco, Portugal, Spain, Switzerland, and Turkey, with itineraries that range from one to fifteen days. For those unwilling to go all-in, Cassandra also offers tips on incorporating day-hike outings into a more traditional vacation. The focus is on how to craft that more immersive vacation so users of the guide will be able to apply what they learn to their own dream destinations.